It soon emerges that the victim, a man who it appears would stop at nothing to fulfil his ambitions, was engaged in research of great interest to those at the very top ranks of Soviet power. When another scientist is brutally murdered, and evidence of the professors’ dark experiments is hastily removed, Korolev begins to realise that, along with having a difficult case to solve, he’s caught in a dangerous battle between two warring factions of the NKVD. And then his son Yuri goes missing . 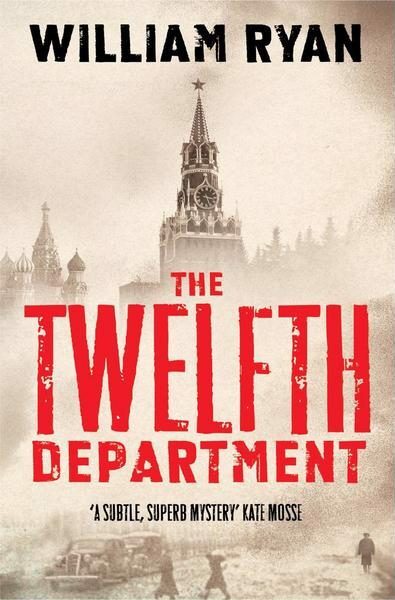 . .
A desperate race against time, set against a city gripped by Stalin’s Great Terror and teeming with spies, street children and Thieves, The Twelfth Department will be published by Mantle on 23rd May, 2013. Shortlisted for the CWA’s Historical Dagger and The Irish Crime Novel of the Year. While the police work will keep readers engaged, the series’ chief strength comes from Ryan’s skilful evocation of everyday life under Stalin. Ordinary Soviet citizens, Korolev included, have become resigned to all forms of corruption and hypocrisy, yet must still wear the mask of communist devotion. larger apartment) that makes this one special. For some time, the talented Ryan has been among the very best crime novelists working in a period setting and if your taste is for similar fare by Martin Cruz Smith or Philip Kerr in which an honest sleuth tries to do his best in a corrupt foreign regime you should not hesitate … The first two outings for Ryan’s sleuth, The Holy Thief and The Bloody Meadow, met with almost universal acclaim and were shortlisted for a variety of prizes. It will be absolutely no surprise if this gleans similar praise. Once again, the balance of pungent period detail and increasingly tense plotting are handled with total authority and Korolev remains one of the most persuasively conflicted characters in crime fiction. Ryan’s tense, tightly plotted whodunnits feel gloriously plausible, a function of the intimate link he forges between his readers and his characters, never mind that those characters are living through extraordinary times. Set in Moscow in the 1930s, The Twelfth Department is the third outing for William Ryan’s increasingly impressive Captain Korolev series. Korolev, a police investigator, is co-opted by the NKVD when a scientist with strong political connections to the party (and possibly Stalin himself) is shot dead, but his task – complicated by the disappearance of his young son, Yuri – becomes a wander through a metaphorical hall of mirrors where notions such as truth and justice mean whatever the party wants them to mean. There’s an Orwellian influence to the manipulation of language and meaning in The Twelfth Department, while Korolev’s quest to uncover the “facts” of his investigation ensures that he soon resembles a pawn kicked around the board by warring superiors. The geographical setting and political backdrop are compelling enough, but Korolev is a fascinating character in his own right, an army veteran of “the German War” who acknowledges the poisonous nature of the regime he serves even as he clings to the hope that its propaganda might someday chime with reality. Ryan … employs imagination and empathy as well as meticulous research; we don’t just see the peeling religious frescoes on security office walls, we feel Korolev’s astonishment at their survival. THIS is the third William Ryan novel to feature Moscow detective Alexei Korolev during Stalin’s reign of terror, and it’s as richly satisfying as its two predecessors. Ryan’s achievement is to make his characters and their milieu so tangibly immediate that you feel you’re actually in their presence. Obviously his historical research has been considerable, but he’s managed the rare feat of subsuming it into his narrative in such a way that it’s never obtrusive – you really do have the sensation of being on that particular street or in that particular apartment block or municipal building alongside Korolev, his tenacious sidekick Slivka or any of the other vividly realised characters who inhabit the book. The Holy Thief, published in 2010, was an immensely assured introduction to this police detective and his perilous Moscow beat; The Bloody Meadow (2011) confirmed that first book’s promise; and The Twelfth Department is even more engrossing, especially for those readers who’ve come to regard Korolev as a trusted friend and sceptical moral guardian in an otherwise unsettling world. Fans of historical mysteries will definitely want to read the tremendously researched The Twelfth Department. When I read one of William Ryan’s Alexei Korolev mysteries, I feel that I have been transported back in time–a time that is definitely not simple or peaceful, but wrought with unspeakable horrors that were similar to those found during the Spanish Inquisition when citizens were accused of heresy and tortured to death. The mystery in The Twelfth Department is intriguing but is strongly overshadowed by its setting and characterization. In fact, the real mystery is not the murders of the scientists but learning what nightmares are transpiring inside the walls of the Azarov Institute. A truly magnificent book: addictive, interesting, well-written and full of interesting characters. Captain Korolev is helping Ryan establish himself as a first rate author of historical crime fiction. I am definitely a fan of this series and already desperate to read the next one.